Author, Celi Trépanier, joined us this week to chat about her new book Educating Your Gifted Child How One Public School Teacher Embraced Homeschooling from Gifted Homeschoolers Forum Press. 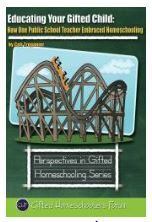 It is part of their Perspectives in Gifted Homeschooling Series. Celi also blogs at Crushing Tall Poppies which chronicles her journey as the parent of three gifted sons and as a new homeschooler. In her own words, Celi writes, as “a homeschooling mom, and a former public school teacher, I’ve been on both sides of the fence of education, gifted education, homeschooling, and gifted children.” Throughout the chat, it was clear that she is a fierce advocate for the rights of all children to receive an appropriate education that meets their needs and for teachers to be given support to make that happen. There are signs to look for when traditional school is not working for a gifted children. Among those mentioned included boredom, depression, acting out, fear of failure, refusing to go to school, and unhappiness. Parents should watch for children becoming reticent about sharing news from school and for mood swings. The decision to homeschool should not be taken lightly. Celi suggested, “Each family likely will have its own unique list of factors to consider like finances, time commitment, state laws, and feasibility.” Mr. Gelston asked, “Can you let go of traditional learning and move to a child centered model based on passion?” Everyone agreed that the child should be a part of the decision with one exception; when a child is in an abusive situation, but too young to know. Resources for homeschooling today are endless (Celi Trépanier) and can be found practically everywhere. Online, Gifted Homeschoolers Forum has an extensive array on their website. Libraries, museums and science centers all offer classes and chances for homeschoolers to socialize. Many areas have homeschool cooperatives where children can learn subjects from experts. And we appreciated the sentiment shared by GHF Executive Director, Corin Goodwin, ” Actually, I think #gtchat is a pretty darned good resource, too!” A full transcript may be found at Storify. Questions for this chat were posted to our Facebook Page. Have you decided to homeschool your gifted child? We would love to hear your story and the reasons you made this decision. Please leave a comment below! Photos/graphics courtesy of Gifted Homeschoolers Forum.